The melancholic lo-fi music of Jeans Wilder has generally been simple and lucid, bringing forth a sad but intriguing sound. His new album Totally contains much of the same, but adds a lot to the simple sound with a variety of instrumental tracking. These beautiful songs are reminiscent of The Cure or Siouxsie And The Banshees by being heavily guitar oriented and reverberated. Totally establishes the setting, a bonfire on the beach with friends, with the first track “Blue Dreams”. This is very important as it creates the setting for the experience of the whole album. Imagine being on the beach with a few of your very closest friends, enjoying nothing but the sounds of the waves crashing on shore and your toes in the sand. One of these friends pulls out his guitar and Jack Johnson’s dream becomes realized right before your eyes. You are Totally in for an awesome evening. The night gets even better when you remember to pull out that “gravity bong” that you prepared for the occasion. The guitar seems to mesmerize you into a deep sense of comfort. You smoke a bowl, and listen to your friend play and sing his songs. The guitar playing may be a little basic at times, but the music is excellent and you can’t take anything away from the beautifully drawn out chords you are enjoying. Another friend jumps in the mix and starts harmonizing the melody, which brings the music to a whole new level of intrigue. Just when you think the experience you are a part of can’t get any better, someone shows up with some maracas and starts creating a rhythm section for the music. The night has turned into an all out jam session on the beach, everyone is having a good time and the drinks all seem to have “evaporated” along with the heavy-hearted lyrics. A joyous and happy dance track has engulfed the party, the up-tempo beat is right on and the lyrics are non-existent. Somehow this small gathering of friends has turned into a full-blown concert. Totally is an excellent lo-fi album that is creative as well as musically talented. With heavy use of reverb on both the guitar and vocals, it can sound very dream like. The voice quality of Andrew Caddick aka Jeans Wilder is supreme and seemingly designed for this style of music. His second studio Album is initiating a lot of buzz because of its diversity and ability to induce a dream-like state to the listener. An evening listening to Totally is a totally awesome evening. 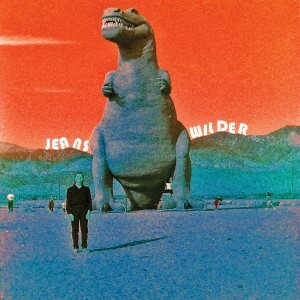 Download Jeans Wilder’s “Spanish Tile” Here.